Do a favor by retrieving an item from a bandit hideout. This is a radiant quest which you can receive from either of the following people. The dungeon is randomly determined from the Bandit Camps present in the quest giver's hold. It is a standard fetch-and-return quest. The item will be found in the boss chest in the target dungeon, and is treated as a quest item. My Saffir doesn't like that I've been spending so much time looking for my father's old sword. He fed his entire family with the gold he made using that weapon. I'm not about to let it gather dust in some thief's trophy room. Volunteering to retrieve the sword for him triggers the start of the quest. When you return the sword, Amren gives you a one point bonus in both Block and One-handed, commenting, "Here, my father had a favorite sword and shield technique. Let me teach it to you, in honor of his memory." We have not faired [sic] well outside our native Black Marsh, but we're determined to make the best of things. I began praying to Zenithar, the god of wealth, to bring us some fortune, but thieves made off with my sacred amulet almost as soon as I bought it. Volunteering to retrieve the amulet triggers the start of the quest. 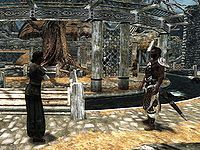 When you return the amulet, Shahvee gives you a one point bonus in both Light Armor and Lockpicking, commenting, "Before I came into Zenithar's calling, I confess I was a thief. But I learned a few things in my time that might help you survive. Let me show you." It is impossible to do both quests at the same time, e.g., if you do the quest for Amren, you are unable to do it for Shahvee until you have completed the quest for Amren. On the PC, it is possible to use the console to advance through the quest by entering setstage Favor204 stage, where stage is the number of the stage you wish to complete. It is not possible to un-complete (i.e. go back) quest stages, but it is possible to clear all stages of the quest using resetquest Favor204. This page was last modified on 27 June 2016, at 04:56.